OK then, lets give Tesco a go. After the amazing Leoville-Barton tasting earlier I the week I thought I’d go to the farthest extreme and taste some “cheap” or “bargain” wine from the UK’s biggest supermarket, and the biggest supplier of wine to the UK consumer in volume (definitely) and value (probably). Me and The Fish hate shopping at Tesco. It reminds me of an awful amusement arcade full of families screaming at each other. Having said that, we often use the Tesco Express at the end of our road as it is very convenient, you know what you’re getting and you know the price will be decent. But we needed some ingredients for Sunday dinner so went to the Tesco supermarket in Rickmansworth. It wasn’t fun, but it was interesting. The wine section is actually very well put together with three distinct sections. 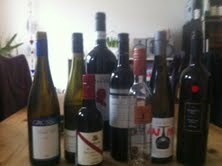 The first is for offers, the second is arranged by colour & country, the third is fine wine. In between the sections there are also some “have you tried this” sections with useful advice on different grapes, growing areas and food matches. Well done, tick! By the way, the fine wine section had a really good selection, including a M Chapoutier Cote Rotie 2009 for about £30… But that’s not what we’re here to discuss today! We went to the offers section, and I was looking for a 3 for £10 offer to lambast… But nothing so incredible to be found. Even that crappy Italian Dino rubbish was at £9.99; I wonder how many bottles they sell at that price?? It was in this section, however, that The Fish spotted the “Simply” range at £4.79 a bottle. Now this is a great idea. 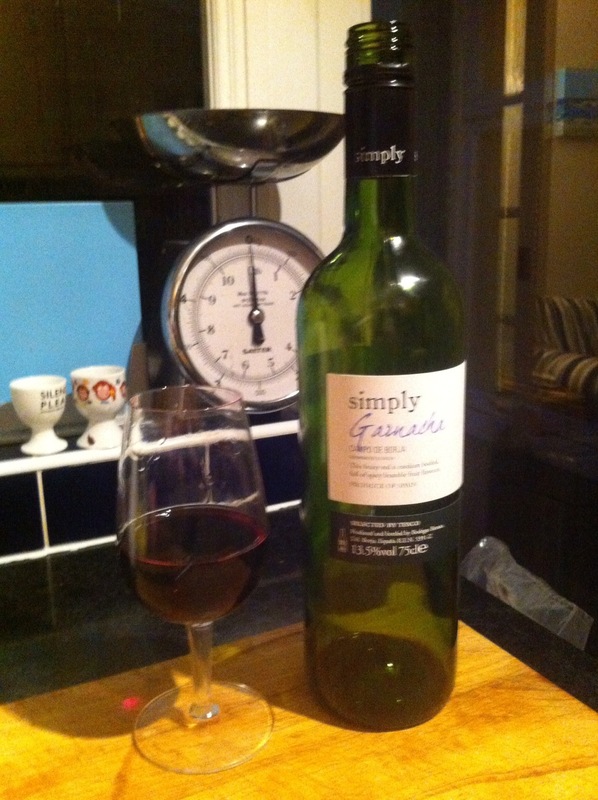 Tesco has taken the New World direction and “simply” put together a range of varietally named wines. If anyone watched “Chateau Chunder”, the programme on BBC4 earlier this week about the growth of Aussie wine, they will recognise the importance of this simple strategy. So we decided to go for 2 of these to try on a Sunday afternoon. 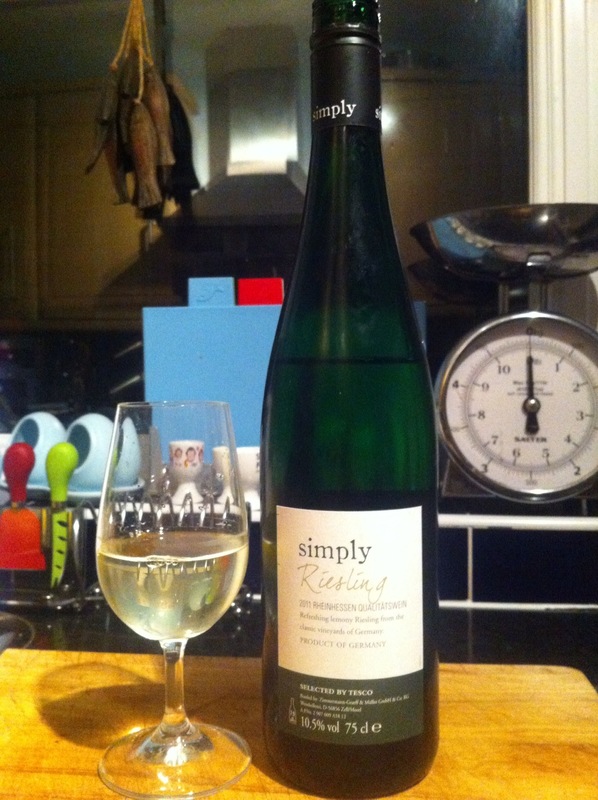 “An authentically German Riesling, with well balanced flavours of green apples and citrus fruit with a juicy finish”. Barcelona. The good, the bad and the bubbly! Now my knowledge of Spanish wine certainly isn’t great. I know my Rioja from my Ribera, understand the difference between a Crianza and a Gran Reserva, and love the refreshing whites from the the north of the country, particularly Verdejo and Abarinho. But what about Barcelona, and what about Penedes? The white wines by the glass are simple affairs, reminiscent of the slightly round white wines from the Rhone; pleasant but lacking that streak of acidity to really give them a lift, especially when drunk with some of the marvellous seafood pinchos. What I was really surprised and delighted by are the number of varieties grown in the area, and the quality of the wines produced using the more commonly known grapes. 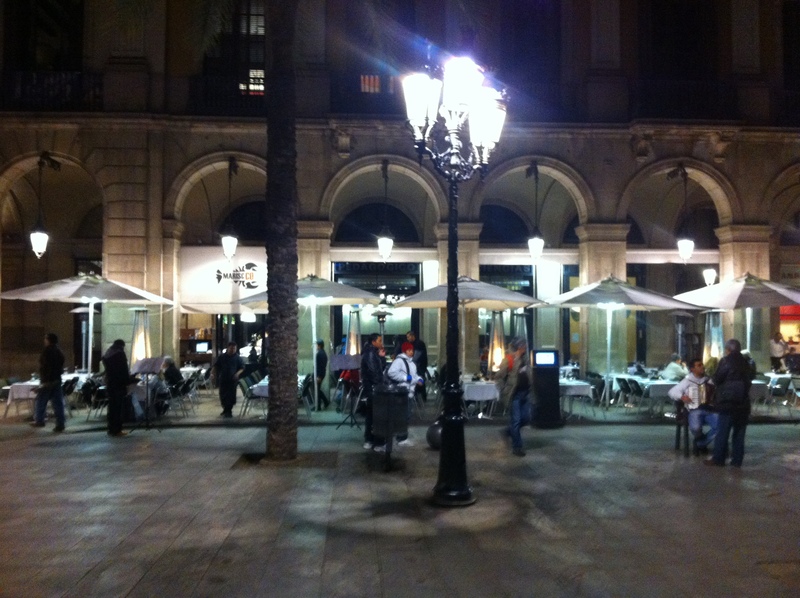 For lunch on our first day we sat down at a very good seafood tapas restaurant, Mariscco in Placa Reial. Looking through the wine list, what caught my eye was a Penedes DO Riesling (Torres Waltroud 2011) so I went with my instinct and what a good choice it turned out to be. At first taste I thought it may be a touch off-dry, but this was simply the juiciness of limes and pineapple chunks coming through. The finish was actually bone dry and rather reminiscent of a wine from the Clare Valley – a very modern and enjoyable wine (89 points). The seafood was outstanding. Percebes, langoustine, clams, cuttlefish, followed by some beautiful veal fillet. We also enjoyed some simple but refreshing Basque white wine in a couple of the great pinchos bars; nothing to write home about with too much conviction but perfect for this most superb method of informal dining. The best seafood dish ever?? 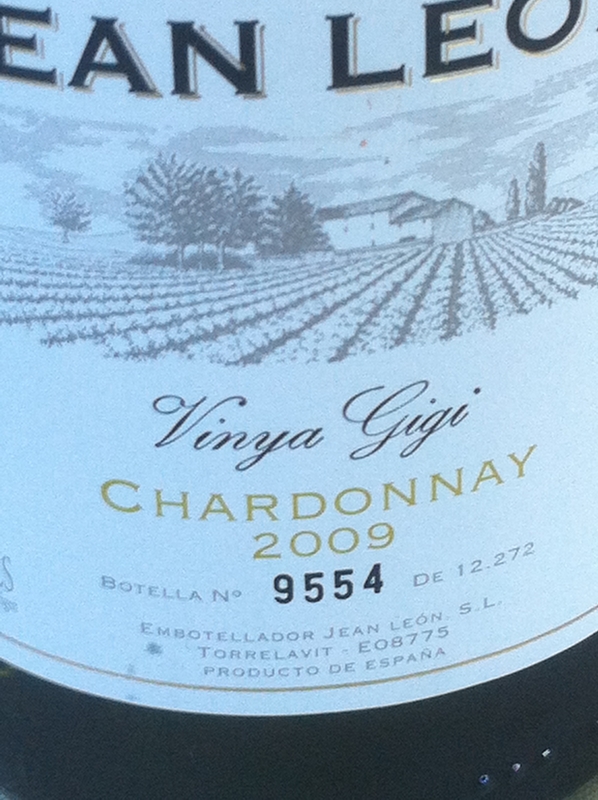 The second memorable white was the exceptional Jean Leon Chardonnay 2009. Only 12,000 bottles produced in the vintage and ours was bottle number 9,554. The wine had beautifully integrated oak, which surprised me when i found it had spent 9 months in new French oak. The nose was a pleasant apple and pear combo, with the fruit coming through in the taste, swathed in a rich vanilla cream. Once we took the wine out of the ice bucket we were able to enjoy it at its full and charming best (91 points). 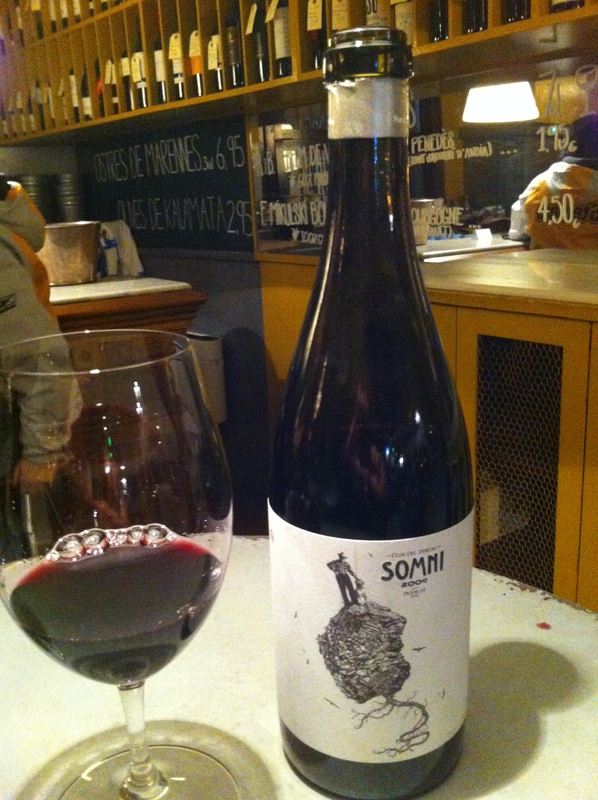 What I haven’t mentioned is Can Majo, the superb restaurant where we enjoyed this wine in Barcelonta, overlooking the sea. The Majo paella was maybe the best seafood dish I have ever eaten and I implore you to go if you ever find yourself in the vicinity. So what about the reds? Well this is the only “bad” I can write about. And the main reason is the lack of local red available by the glass. Rioja – tick, Ribera – tick. But very little of the local stuff. The couple of places we did find with Penedes, or if we were very lucky, Priorat, on the list by the glass were fantastic! The Garnacha is spicy, yet silky, concentrated and inky. It was just such a shame that there was so little around! 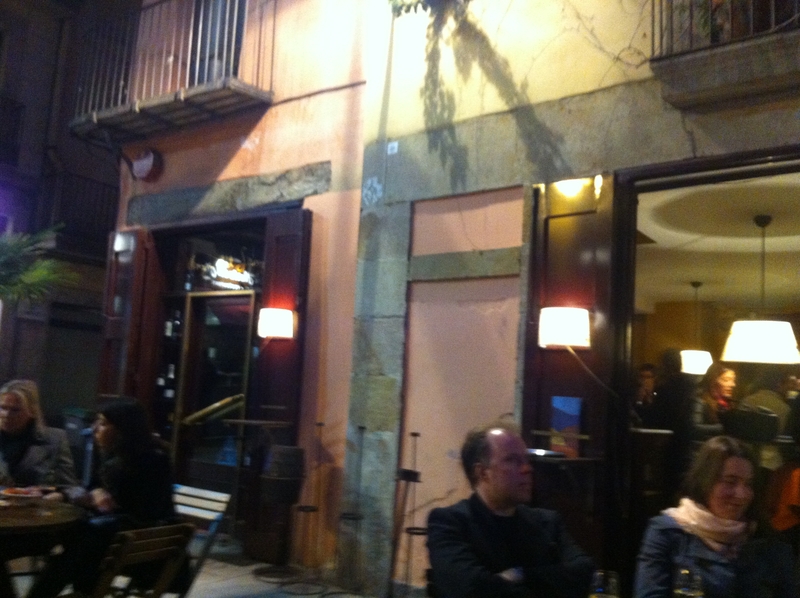 On our last evening we went to the superb wine bar in Placa Santa Maria, called La Vinya del Senyor. OK, we went the day before and enjoyed a lovely glass of Cava and Ribera, but the list was excellent so we decided to head back for a bottle of Priorat. And boy was it worth it. We asked the waiter for some inspiration and he pointed us in the direction of the Somni 2009. Wow! Spicy, smokey, brambly, black currant and blackberry nose. Lovely cassis flavour, reminiscent of a great black currant sorbet. Warm, concentrated, complex and long, like a black fruit duvet! This was perfect for a chilly evening in Barca (by their standards), and one I will be tracking down for Xmas (94 points). So that just leaves the bubbles. To be quite frank, I’ve never met a Cava I’ve really got along with… Until this weekend. 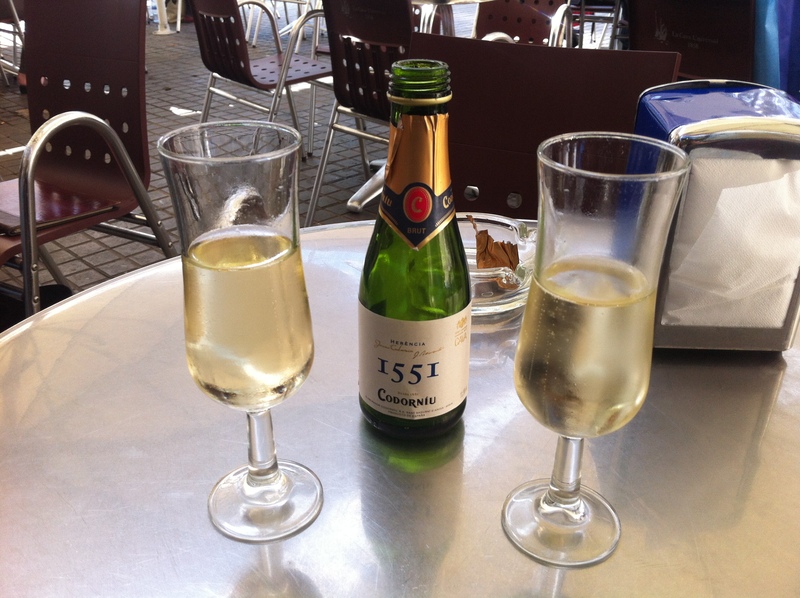 I’ve always found Cava lacking the acidic backbone I so enjoy in champagne and English fizz. But this weekend I found the Cava zing and it was certainly worth waiting for. We enjoyed a lovely Titianna Brut Nutural (extra dry) at the aforementioned La Vinya del Senyor, but the real magic came when we visited Freixenet, one of the biggest Cava producers in Catalunya. I’m going to write a separate piece about the tour and tasting at Freixenet as it is definitely something I would recommend to anyone visiting the Barcelona area, and anyone who feels they don’t quite “get” Cava. Overall, Barcelona is a wonderful city and brilliant place for a city break. The food is simply outstanding, the culture is magnificent and the people are welcoming. As a matter of fact, I can’t wait I go back! I have fallen in love with pinchos – the most social way of eating I have ever come across. As for the wine, well the brooding, fruity reds of Priorat certainly get the gold medal but the whites made from the more internationally recognised grapes are also excellent and I look forward to finding some for my collection. There isn’t any really. 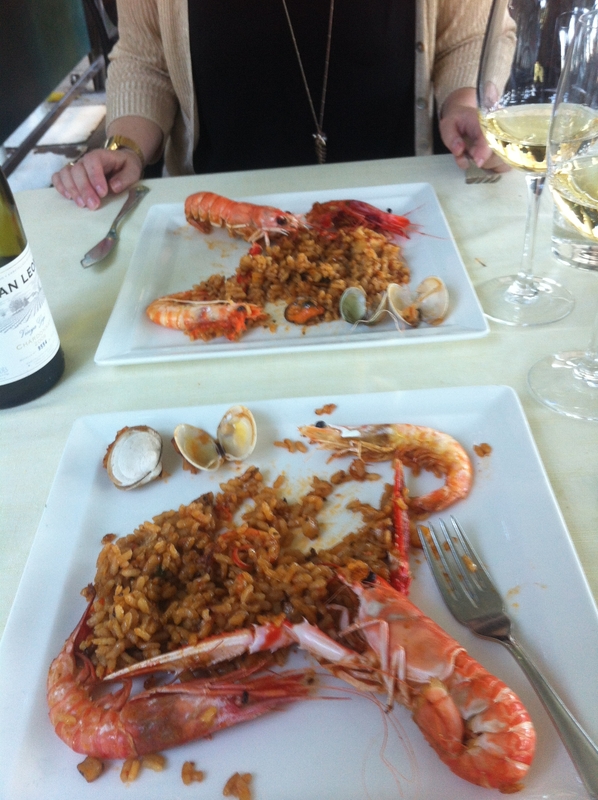 The biggest bugbear was the lack of local wine by the glass and the omnipresence of Rioja and Ribero. In fairness that really isn’t too much of a chore but I think the locals should be proud of their wine and encourage more of us tourists to give it a go. Well I’m a Cava convert. The cheap stuff we buy in supermarket in the UK really doesn’t do this drink any justice. There is so much choice and there are some really complex wines out there – you just have to search them out and have a bit of patience. I will write up my notes from the Freixenet tasting in the next day or so to try and give a bit more depth to the subject.